Saw this a while back but his deadline is approaching quickly. I have asked if he intends to release any more for the Jaguar. Unfortunately, Escape 2042 did not get funded. Orion said he'll still release the MegaDrive and GameBoy versions on his site. Other versions may or may not see release. Here is another Kickstarter that should be of interest: Nintendo Oddities & the Homebrew Revolution: Video Game Book. This is very well pledged already. SNES fans, here is a Kickstarter for you: Unholy Night SNES Fighting Game Console Cartridge Unreleased. Great looking game. It's only $35 too which is cheap! It does look good and it is not expensive. I wonder if it'll work with the Retron 5. Here is a Kickstarter that may spark some interest. 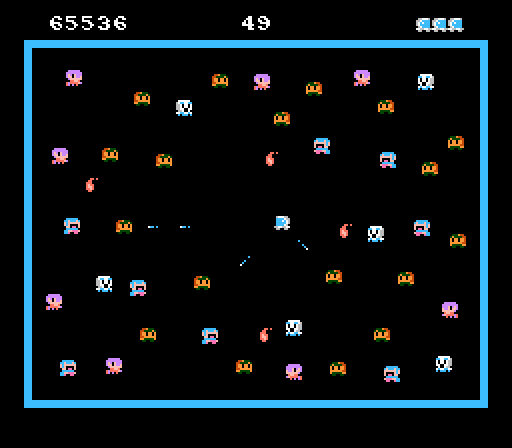 It's a new game for the NES inspired by Robotron: Spook-o'-tron. Here is another Kickstarter that may be of interest: Battle Princess Madelyn. That looks really good. Cool story behind it too with his daughter helping design it. Yeah, I thought it was a cool story also. Who says that girls can't be knights? You've got that right! BTW, Escape 2042 will also be released for the Jaguar at Orion's site. I haven't backed a KS in a long time, but I couldn't pass this one up. I rarely use my N64 just because I hate the controller so much so this is exactly what I needed. Looks great and it's not expensive either. They just launched the campaign two days ago and it's already well past the goal.